Re- purposing favorite things. I am not a thrower outer! I love my things and the older they get the more I love them. However, it is true that some things no longer have usefulness, and they can become clutter. Time to repurpose! 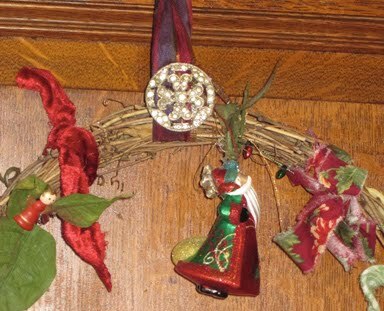 In this Scrap wreath – old jewelry, fabric scraps, favorite, yet damaged Christmas ornaments can be charmingly reunited into a wreath that celebrates their history. Bare grape vine wreath- any size. Scraps of old textiles- I’ve used cut up napkins, a fabric belt from a child’s dress, a scarf, ribbons- perhaps from another Christmas, any old bit of cloth that I particularly like. Vintage jewelry- old buttons, broken earrings, brooches without clasps, chains without pendants, beautiful but no longer functional piece of jewelry can be used. Bells, music is nice on a wreath – as a door opens the tinkle of Christmas Bells is heard. Ornaments – they break, they lose their hangers, but you still love them! 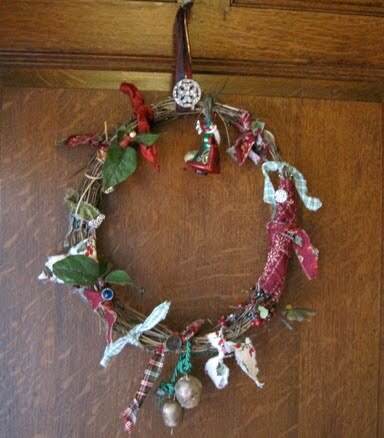 Incorporate them in your scrap wreath! I am all for simple – I simply cut my fabrics to an appropriate size, and tie them on. A little glue can mount an old button or earring in the center of a bow, I tie or hot glue the ornaments on, using repurposed ribbon, or cords for the ties, and my wreath hanger is made from an old ribbon, highlighted with a vintage rhinestone brooch. This is fun to do on your own one evening, but also worth having a party over! 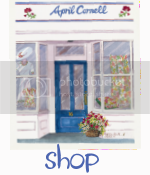 Party Ingredients: Collect old scraps and bits, ask your friends to bring the same, provide the bare wreaths [a contribution of $10.00 per guest will more than cover it]. Allow about three hours for the party. Refreshments - punch and cookies.